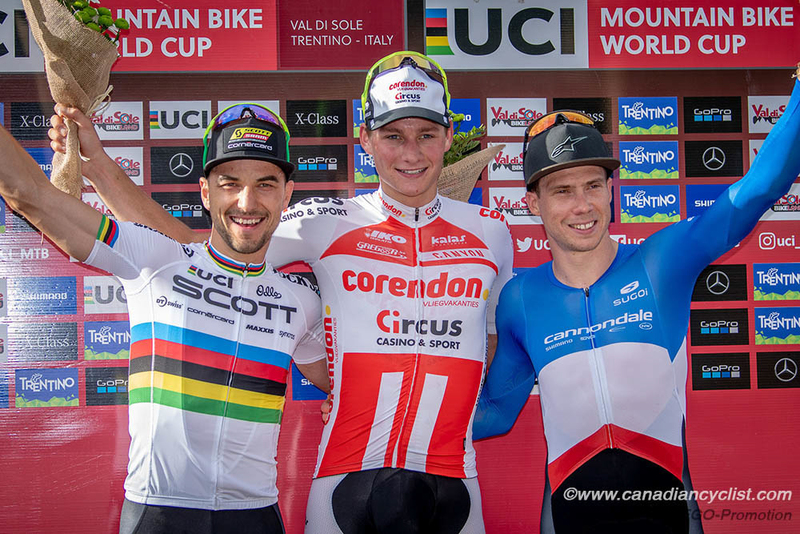 Annika Langvad (Specialized) and Mathieu van der Poel (Corendon-Circus) continue to dominate the new XCC (Short Track) discipline at the Mountain Bike World Cup, with Langvad winning her third straight XCC and van der Poel his second in Val di Sole, Italy, on Friday. 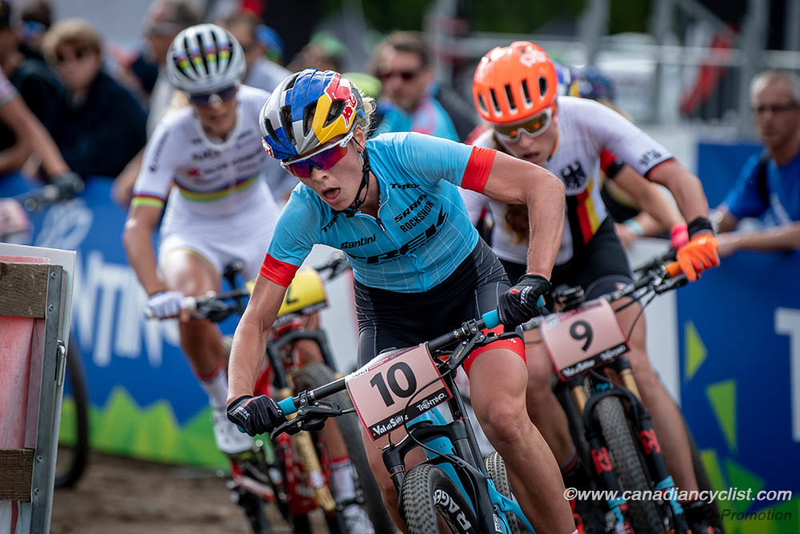 Raced on a short, two minute circuit for 25 minutes, the top 40 world ranked riders vie for World Cup points (50% of the cross-country), plus the top 16 finishers start on the first two rows of Sunday's XCO race. Emily Batty (Trek Factory) was Canada's top rider, finishing seventh in the women's race. While the first two rounds of the XCC have been on mostly flat circuits with pavement, the Val di Sole version had no asphalt and began with a stiff climb backwards up the Downhill course, before taking the riders onto the 4-Cross circuit for a rock garden, pump track section and banked turns. World champion Jolanda Neff (Kross Racing) attacked on the first climb of the women's race, which proved to be a tactical error after she faded badly, only recovering at the end to finish eighth. Langvad bided her time, moving to the front with Pauline Ferrand Prevot (Canyon Factory), Alessandra Keller (Thomus-RN Racing) and Anne Tauber (Sandd American Eagle) on the fourth lap of ten, and then dropping everyone but Keller with three laps to go. 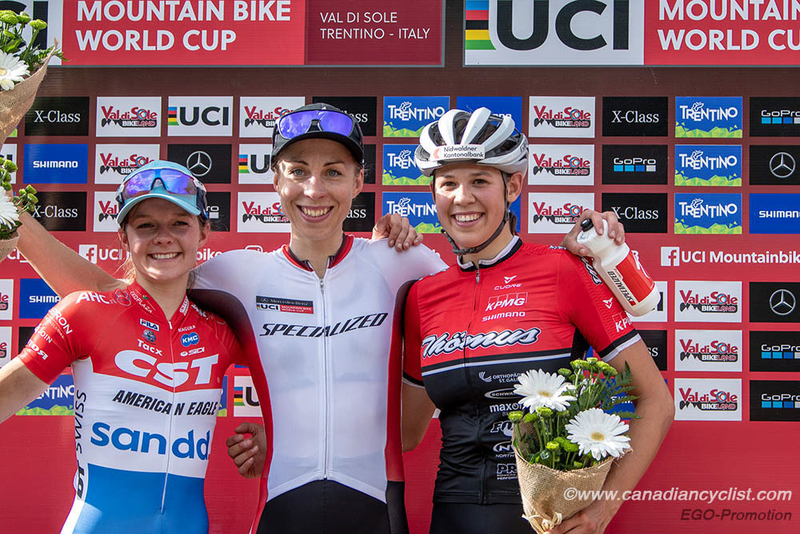 A lap later she dropped Keller on the climb to solo in for victory, with Tauber finishing second and Keller third. Langvad's win padded her lead over Neff in the World Cup standings. "It was definitely not easy," said Langvad. "I was more nervous going into this one than the previous ones because there is pressure when you have had two wins in a row. It was different [than the previous XCCs] because it didn't come back together, so it made my strategy easier on the deciding hill. When Jolanda [Neff] attacked, I thought 'this is going to be tough', but then she completely blew on the second lap, and then Pauline [Ferrand Prevot] attacked and then [Alessandra] Keller ... it was just attack, attack, attack on that climb, and in the end it was just a question of endurance." Batty rode a conservative race, staying in the top-15 for much of the race before moving up in the final few laps. Her result means she will start on the front row, on Sunday. Haley Smith (Norco Factory) and Sandra Walter (Canadian National) finished 22nd and 23rd, respectively. "That was a crazy hard track with quite a lot of climbing," said Batty. "I didn't feel that great and had a bad start, getting stuck behind another rider. Hoping for better feelings on Sunday." Smith, who has finished top-16 previously, said "It was a very hard race with some really steep climbing. It was quite hard to move up from my starting position because it became single file almost immediately, but I did what I could and laid it all out there! I paid for my efforts to get inside that top-16 and faded in the last quarter of the race. All good though - after this little tune up, I'm confident the legs are there and excited for Sunday!" 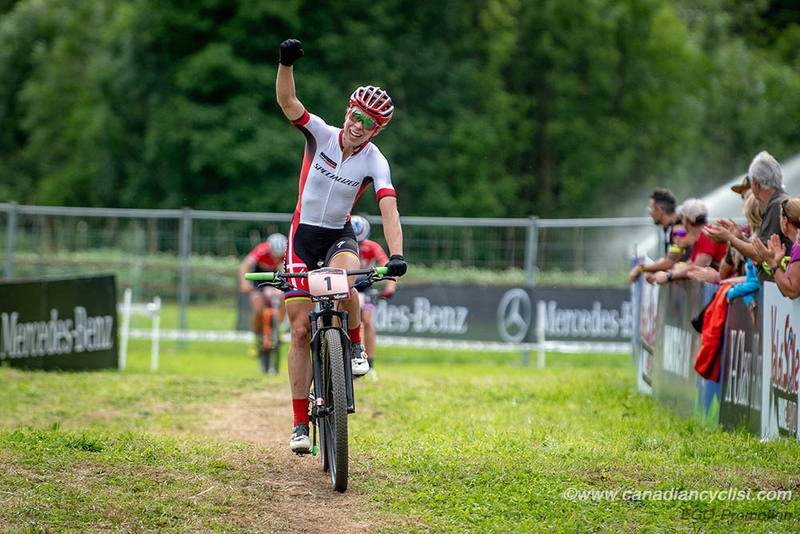 Sam Gaze (Specialized), winner of the last XCC at Nove Mesto, Czech Republic, led the men's field up the first climb, however, quickly fell off the pace after that as the leaders were whittled down to van der Poel, world champion Nino Schurter (Scott-SRAM) and Lars Forster (BMC). Forster attacked on third of 11 laps, but was quickly brought back by the other two, and then dropped on the seventh lap when van der Poel unleashed a massive attack on the climb. Schurter could not close the gap and lost further time through the remaining laps as van der Poel continued to pull away each time up the climb. Schurter held on for second, three seconds ahead of a chase group, with Maxime Marotte (Cannondale Factory) winning the sprint for third. Schurter remains in the lead for the overall World Cup standings, however, van der Poel has overtaken Marotte for second place. 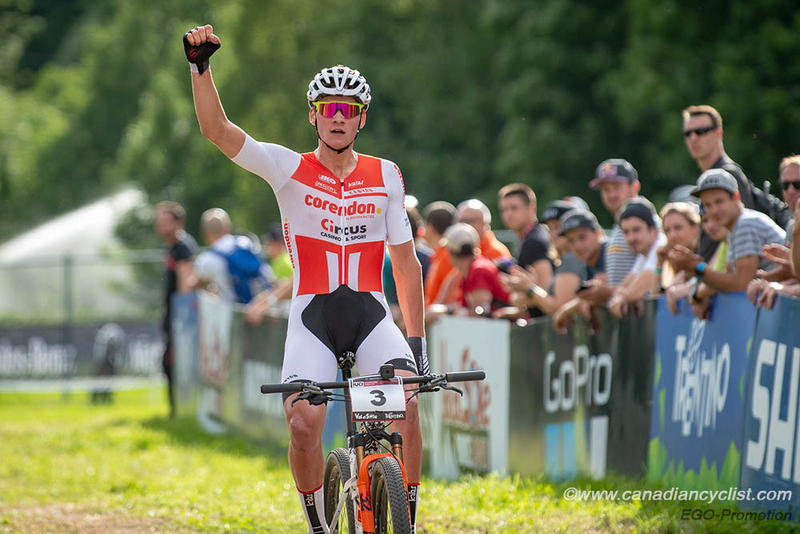 "As I expected, it was really, really hard," said van der Poel. "Full gas on the climb, then a little bit of recovery, and then the climb was there again. Those 30 second sprints I'm good at, and I enjoyed racing it today. Sam [Gaze] started really fast and I know it hurt everyone, so on the second lap I did it again."